In a week that had already been packed full of running I found myself standing at the start line to the James Herriot Country Trail Run chatting to Geoff Davis and Penny Browell, Susan Davis having dropped back a bit further from the start line. In an instant chatting turned into a frenetic mayhem as the announcer suddenly started the race and a few hundred bodies set off in the same direction at very different paces. 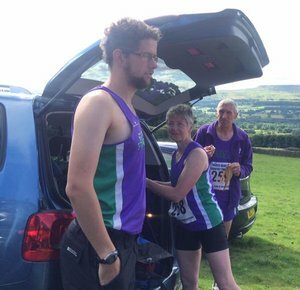 The first section must have been 500m or so but took the runners through Castle Bolton and up to the start of the fields and the first climb. The next kilometre was a climb up through fields and small tracks during which I chased a small group of 6-7 men with a Quaker Runner at the tail hoping that they could shield me from the wind buffeting all of us and threatening to blow my number back down to Castle Bolton. It wasn’t long into this climb that my lungs were hurting but almost everyone nearby was puffing like a steam locomotive and those that weren’t were walking. For me it was a matter of digging in, steeling myself mentally and keeping the knees high and legs pumping. After what seemed like an age with too many false horizons we reached one of North Yorkshire’s typical flat topped fells and the race continued along the spine of the fell, the terrain now undulating with a slight incline. Now it was a matter of holding my place against the attacks from runners behind and staying as near to the Quaker Runner ahead as possible but while I kept most runners behind, besides the odd man storming by at a rate of knots, I lost ground to the runners ahead when I went over slightly on my right ankle again, a problem that has plagued me at almost every recent race. Soon the next stage could be seen, a steep descent followed by what looked like a painfully sharp ascent. The descent came soon after a water station where I failed in attempt to get a cup, when I made a grasp for the one cup the woman offered the other and withdrew the one I was aiming for. It felt like I was flying down the descent with my feet barely touching the ground and arms no longer pumping but aiding balance, there is nothing more satisfying then free distance but soon after the steep climb started it steepened even to the point where at the top I walked a few yards. After what was the last major climb of the race the rest was mostly downhill on good trail, with gravity doing most of the work until the last 3 or so miles where the course flattened and headed on back to Castle Bolton. At this point I was on my own (or so I thought) I could see the man from the Quaker Running Club 150m ahead and I had left another runner, who had been attacking on the top of the fell, during the descent. So coming up to the last water station I was very surprised when the 1st lady shot into my peripheral vision to get a drink. I then decided to make the most of her water stop and shoot off as fast as my tired legs would take me towards the finish and it worked for a time until with a little less than a mile left she overtook me going at what must have been a min/mile quicker, I had no chance of rebuffing such an attack and she even ended up taking the Quaker Runner ahead by the end as well. For me the race was just a procession to the finish line with a token sprint put in for good measure. What had started in a whirlwind of frenetic energy now ended up in a calm manner for the most part, with runners who were usual quite strung out came across the line. The only excitement was seeing Penny and Geoff coming towards the line, Geoff behind at this point but with a cheeky smile which spoke volumes. I could see that he fancied his chances of an overtake and our mudman didn’t disappoint using all his experience, cunning and competitiveness to pull off a perfect overtake and win the battle of the Striders. A bit late the mudwoman finished to take 2nd in her age category rounding off a thoroughly testing but enjoyable day out in Yorkshire. 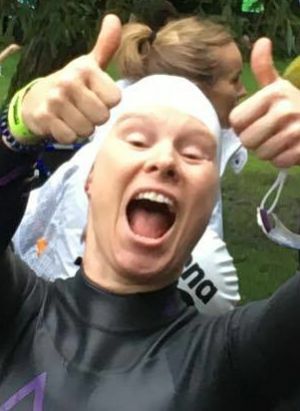 I was so happy to have even made it to the start line of this event after six months of hard training and a knee injury which meant that I hadn’t run for more than six miles since January. For the last week I’ve lived on a diet of ibuprofen and practically bathed in alcohol hand gel so I didn’t pick up any last minute nasties. This event is logistically complicated in that it’s a split transition. This means that the bike start and the run start are in different locations 12 miles apart and the finish is in a further location in Bolton town centre. I travelled down 2 days before the event to take my time registering and setting up the two transitions. My Tri club buddy and twice Ironman himself, Tim Matthews, was my domestique for the weekend and was tasked with the challenging job of keeping me calm!!! After registration and the welcome party on Friday, we spend Saturday setting up the two transitions and I was able to get into the Lake (Pennington Flash) for the practice swim session as luck would have it with my coach Sorell. The lake was much better than I expected – fairly warm and reassuringly murky (I am not remotely interested in knowing what lurks beneath!!). We also managed to meet up with my fellow Durham Tri competitor Bob Hewitson and have a hearty carbo loading breakfast and a nervous chat about the upcoming challenge awaiting us the next day. So off to bed for an early night for an extremely early start but not before applying the ever important race number tattoos (so damned cool!!). So race day arrives – up for a 3am breakfast in the hotel then onto the shuttle bus to the lake for a 4am and pitch black arrival to the start but thankfully no rain. Wetsuits donned we arranged ourselves in the chute to enter the swim in predicted swim time order. On my way down to the water I spotted my wonderful supporters from Durham Tri club – Tim, Lesley, Amanda and Olivia which gave me a nice little boost. At about 6.25am I was off!! The swim course consists of a 1.9K lap of the lake then an Aussie style exit from the water to run around a channel of about 50m to the roar of the crowd before jumping back in for a second lap. I exited the swim in a satisfactory time for me of 1hr 30mins. Into the T1 tent which unfortunately had a surface underfoot of thick squelshy mud (but made my cross country soul feel rather at home!) On to the bike and off I went to tackle the 112 mile ride. This bike course is rather challenging featuring over six thousand feet of elevation. 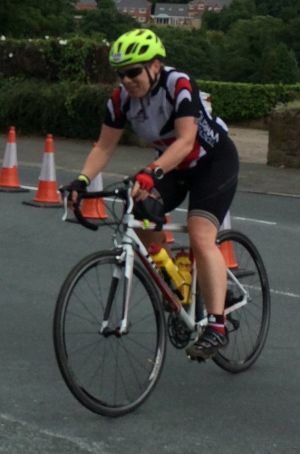 The route consists of a 12 mile trip out to the village of Adlington then two 50 mile loops. The two most legendary climbs are entitled 'Sheephouse Lane' and 'Hunters Hill' which are obviously done twice each. The support of the crowds was fabulous around most of the course but most notable on these two aforementioned climbs. Huge crowds lined both sides of these hills, music was blasting in places and encouragements being shouted – a real Tour de France feel. There is quite honestly nothing like the sight of a man in a mask, cape and mankini dancing to the tune of ‘Uptown funk’ to lift the spirits when the legs are getting tired. I did find it quite challenging to eat and drink enough to keep well fuelled – very surprising for those who know me well!! The taste of isotonic Powerbar energy drink after 4 litres, chia bars and sweets can become very tedious. I took up the option to have a ‘special needs’ bag available to me at mile 88 and experienced a moment of sheer ecstasy when I extracted and devoured my packet of salt and vinegar square crisps which I had cunningly placed there earlier. I even managed to eat a couple of ham and cheese croissants to make sure I had something in the tank for the ever approaching marathon. 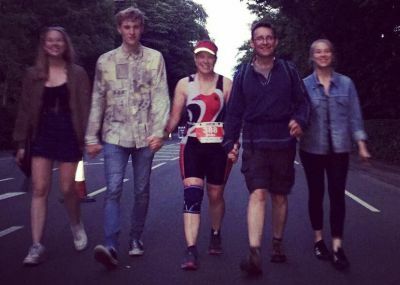 I saw my own family twice on the bike route at the most remote part of the course which was fantastic and the Durham Tri support crew cycled their way to two vantage points to cheer me on. Tri club coach Ian MacKenzie also made two surprise appearances on the bike route which again gave me a great boost. All was going rather well pacing and timing wise until disaster struck at 100 miles – a rear wheel puncture, arrgh! Now to put this into perspective, in 10 years of cycling I have never had a puncture – what a cruel world this is. Thankfully I had practised this in the week before the race so tried to stay calm. I had been introduced to CO2 canisters which inflate the tyre to 100PSI in 3 seconds – a god send. About 20 mins later I was on my merry way again and before long found myself at the finish of the bike leg 8 hours and 20 minutes later in T2 at the Macron Stadium to the welcome cheers of my fans. Unfortunately my Durham teammate Bob had fallen off his bike earlier in the race and fractured his wrist, so his racing day was sadly over. 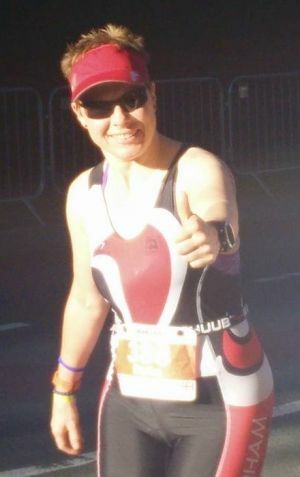 By this time of the day the sun was well and truly shining so I lathered on the suncream, donned my fresh tri suit and socks, said a quick prayer to the God of injured knees and I was off to face the most challenging part of the event. The run course consists of a six mile run from the Macron Stadium then a hilly six mile loop of Bolton town centre which is completed three times. I set off on a 4 minute run (which very quickly became a shuffle) followed by 1 minute walk strategy with the aim to keep this up throughout. It started well and the route was fairly pretty along a canal path which offered some welcome shade and a blissful stretch of off road surface, yippee! This only lasted for 1km unfortunately before it was back to soul sucking tarmac. I then joined the three loop part of the course where we were rewarded with a different coloured hair scrunchy to proudly wear on our wrist on the completion of each lap. Again nutrition was a major challenge and my stomach had simply had enough of trying to digest vile food options whilst competing with the muscles for a blood supply to enable this. I managed to get down a few gels, bananas and tortilla crisps washed down with lashings of coke and water. Jules Percival had bought me a packet of polos on the assurance that they were marvellous for warding off nausea in endurance events. Wow was she right and I rewarded myself with one after every 5k of running completed. By the time I started on the loops I felt absolutely cream crackered and can honestly say the support of the crowd and other competitors got me through. The lovely people of Bolton were out in force for the whole route; their enthusiasm helped no doubt by the sunshine and for some ice cold beers in their hands. 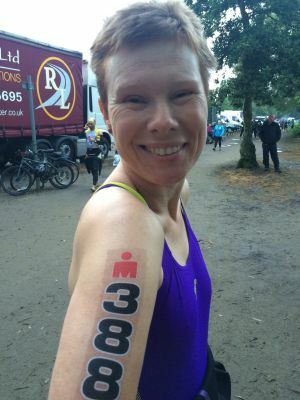 My tri family were along the route and also my coach and her colleagues from Tri Training Harder which was wonderful. The real saviours of the day, however, were my Hubby and kids which had positioned themselves half way up the long drag of a hill. They proceeded to take it in turns to run with me for short stretches, hold my hand, give me hugs and encourage me that 'I had this'. My son Rhys later told me that watching the marathon was like watching an episode of the zombie drama 'The Walking Dead'. Never was a truer word said as I definitely felt like I was starring in it at some points. On each loop when you hit the town centre part, you are faced with the roar of crowds driving you on and a trip past the finishing shoot which gives you a taste of what’s to come. 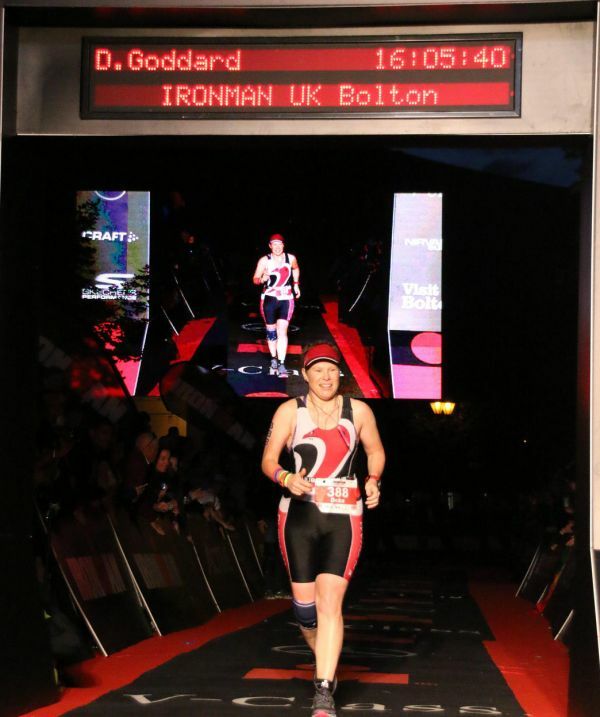 At long last and 5 hours and 49 minutes later and a total time of 16 hours and 5 minutes it was my turn to hit the red carpet and do my victory dance to the sound of the yearned for words of the PA “Debs Goddard you are an Ironman” – it was an awesome moment and one I won’t ever forget. 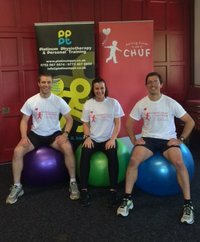 It's about four and a half days since we finished our inaugural 24hr Swiss Ball-a-thon for CHUF, and we are all still buzzing (and a bit sore!). 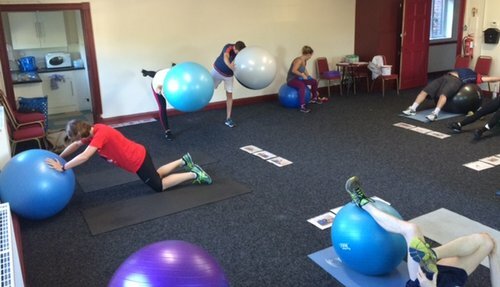 In a nutshell, the event involved 24 X 1 hour classes on the Swiss Ball, which as you may know is something we use for many of our patients and run a dozen classes weekly. 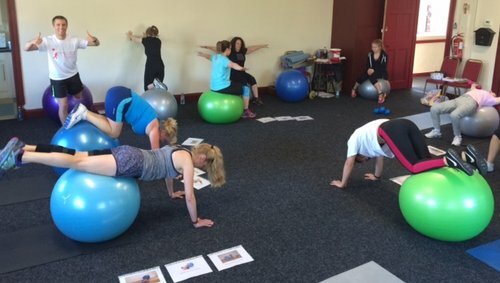 The ball provides the ability to bring in so many different exercises for all levels, and so to appreciate the difficulty of being a parent of a "heart-bub" on the Children's Heart Unit, Freeman (CHUF) for a day we decided to do the 24 classes consecutively. Starting at 1100am Fri, we were blessed with many Striders in the first group (Mums on the Ball group) who literally got the ball rolling. The atmosphere was electric as people did more than their usual weekly session, and as our staff were always participating at full intensity we knew some interesting times ahead! By 9pm more Striders had come and gone (including first-timer Jan Young with 2 consecutive classes, well done!) and by midnight, some 13 hours in, the place was as full as it had been at the start. 0100-0500 Sat was special, as the amazing "Mum on the Run" Helen Rodgers joined my colleague Trevor and myself for 4 hours of non stop, intense, Swiss Ball madness! 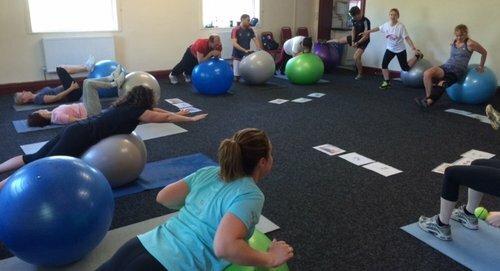 128 different exercises were performed (our whole database) playing a game called Swiss Ball Bingo when random numbers are selected to choose the exercise. Check out the video on Facebook on the Platinum Physiotherapy page to see what we got up to, tough but fun! As the final stretch approached the Striders kept on arriving including the Hamills, Parkers (including kids taking part! ), Kath Dodd doing two modified classes in her knee brace and finally Catherine Smith/Teresa Archer doing their first class ever. With one final (agh!) the last class finished and Trevor/myself collapsed after having done 15 hours each of intense Swiss Ball work covering the whole 24 hours. 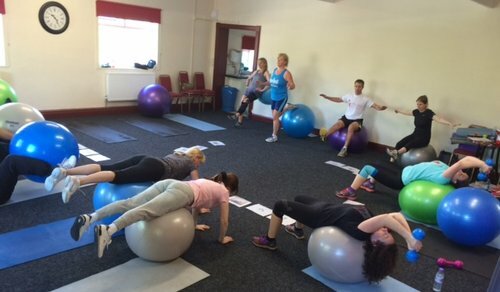 In total our staff did nearly 50 classes and over 160 classes were completed by our patients/supporters! Thank you so much to all those who took part and supported us for such a great cause, the Just Giving page with all the details is still live for anyone who wants to support the event even now. We can't wait until our next challenge but for now my abs are ready to get me through the upcoming Brisbane Marathon as this has to be the best Strength and Conditioning I have ever done, it's just a shame the 40 hours without sleep could not be a regular fixture as still shattered! Keep running strong! I had been looking forward to this race following my great experience in 2015. This race is a very fast 5k course. On this night the sun was out and the wind up slightly, but no conditions to make the pb seekers fear their results. Ladies and M50's were the first group of people to charge down the 1k hill at the very start of the race. Elbows all out hoping that you don't trip. Once reaching the bottom of the hill a crowd of spectators greeted the eager runners as they started their small lap of the park. Clearly marked kilometre signs were positioned en route for those keeping to a set pace. As you finished the first loop of the park you approach the supporters again, Simon, Allan, Graeme, Mark, Stephen and Gareth were shouting loudly. Next is a larger loop where runners do a loop of the lake, at this point the wind was certainly making its point in slowing me down. A lady who I often race against at the NEMAA ran past me which bucked me up a bit, I knew I was on par with her so my new aim was to keep on her. A little mistake I made last year was that I didn't push on the winning 'straight' (I was unaware where the finish was) and this year I was determined not to repeat my mistake so I started to pick up my pace and give my all. A nasty little incline on the finishing straight certainly finished each runner off nicely! 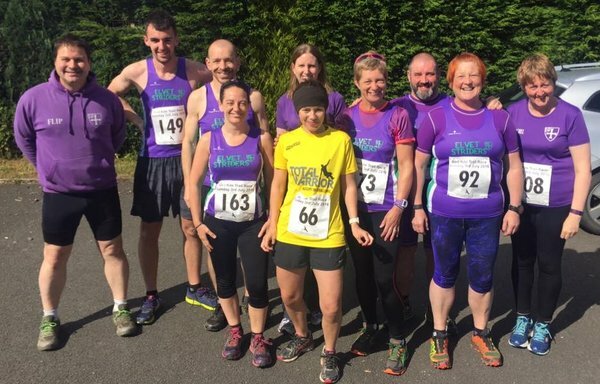 Excellent times from all Striders, Stephen Soulsby, Elaine Bisson, Louise Warner, Lesley Charman, Fiona Jones and Karen Byng, Louise Barrow, Catherine Smith and Victoria Stott. 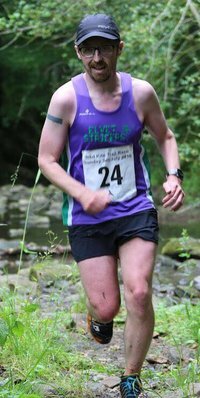 In the second race Strider men running were Gareth Pritchard, Stephen Jackson, Mark Warner and Graeme Walton, all men gave their all as the vast group of runners flew down the hill causing a big draft of wind to hit the spectators. Fabulous runs from all. This race is a brilliant, cheap local race which can be entered on the night and also an offering of a good chance of a pb. See you next year Sunderland 5k!! Come with me across the 21 miles and 9,000ft of the Wasdale Horseshoe Fell Race traversing the roughest and most famous fell country in England. It's raining, windy and the mist is down to about 1,000ft. The race starts along a runable stony track before switching uphill onto the steep, grassy, tusocky and boggy fell side of Illgill Head. We're all walking now, because of the steep gradient, and we quickly enter a world of mist and rain. The gradient eases near the summit and a 'sheep trod' takes us left of the top and on to the first check point atop of the next fell: Whinn Rigg. Visibility is down to about 20 metres and so there is no possibility of seeing the wonderful view down to Wast Water and across the fells of Lakeland. The first checkpoint is reached after about 45 mins (cut off time 1 hour) and the steep descent begins back to valley level. I start well on the thick grass underfoot but lose places on the steeper, stony, eroded path through the bracken. My well worn knees only allow a certain speed and I've no desire to take a fall on a day like this. 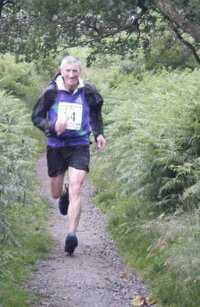 We're now on the only 'easy' section of the race which takes us through fields and woods across the wet Wasdale Valley to Greendale - the home of fell running legend Joss Naylor and his wife Mary. They are both there on the bridge giving out orange juice. "Well done lad, how was that?" says Joss to me. "Not too bad" I reply "do you think it'll fair up today Joss?" He scowls "oh, there's a lot of low stuff still due to come in". I thank him and Mary and head off. He's dead right about the weather of course! Nonetheless it's mild as I begin the upward plod back onto the fells and to the next checkpoint of Seatallan (2266ft). I think of taking off the 'cag' I've been wearing from the start. As if on cue, the rain peps up and the wind increases by a few knots so the cag stays on - for the rest of the race. I cross a stream that's now in semi-spate. It matters little as I'm already soaked to the skin. The occasional runner comes and goes in the mist although a lady runner stays nearby all the way to the summit of the steep, grassy and boggy hill of Seatallan. Two marshals huddle around the exposed trig point with the wind and rain howling around them (this is why they have cut off times!) I pass over my token, tell them that number 25 has dropped out (as requested to do so by the Greendale marshals), thank them and head off towards Pillar; the next check point and some 4 miles distant. An easy, grassy descent takes me into a boggy area glorying in the name of 'Pots of Ashness'. Navigation now becomes a real challenge. With a few other runners I pick up a trod through the thick mist and mire. With careful route finding I know I can avoid climbing the hill of Haycock, and even Scoat Fell, if I get it spot on. Ignoring others that climb up to my left I head onwards on a bearing. I do mange to miss out Haycock but the steep ground pulls me up to Scoat Fell and onto familiar and easily navigable terrain so no matter. Rocky ground is now the norm causing my foot placement to become more measured and my pace to slow. Two runners ahead of me veer off onto a narrow rocky trod that I know avoids a bit of climb so I follow. One of them is uncertain: he turns & shouts his doubts to me. I give the thumbs up and he carries on. The narrow col between Scoat Fell and Pillar is extremely windy and it's hard to keep one's feet. I hold onto the wet rock as I begin yet another steep climb. Other runners are struggling with the conditions and the navigation but I'm confident of the route and just battle on against the elements - at least it's not cold! The summit of Pillar (2'7ft), the next check point, arrives and I'm around 15 minutes inside the cut off. The marshals have some shelter here so are fairly cheery. I hand over a token, they glance at me, establish I'm fit to carry on and off I go. It's a wet, rocky descent from Pillar down to Black Sail Pass and, because of the conditions; I can't see the easier lines that I know are there. Descending becomes slow, laborious and frustrating. Two runners pass me and I vent my frustrations into the screaming wind! Finally I arrive at the pass and look around in the mist for Susan, who I know should be there, and there she is! She gives a little jump as she's been waiting for some time and is pleased to see me! I take a drink, tell her I'm ok and head off on the traverse of Kirk Fell. This is one top we don't have to go over. Some of the runners around me though are unsure of where they are and whether they're on the correct path (or trod). I re-assure them that they are indeed at Black Sail and that this narrow, rocky trod; on this steep fell side running with water is exactly where they should be! The traverse is out of the teeth of the gale and gives a little respite although the wet and the rock continue. I calculate that I have 55 minutes to reach the next checkpoint on the top of Great Gable and conclude, as I'm still feeling ok, that it is just about doable. The familiar ground of Beck Head is reached (the col between Gable and Kirk Fell) and the steepest, wettest, rockiest, crapiest climb of the day begins. The route finding through the rock however takes my mind off the conditions and I pass a couple of guys before reaching the top of Gable (2949ft). I'm very pleased on my arrival as I'm 13 minutes inside the cut off and, although there's still a long way to go, there are no more cut off times to contend with and I'm reasonably confident I'm going to finish! A couple of other guys are faffing around with bearings but I know the way off and I don't want to hang around in this gale. Off I go down across the boulders onto the paved bits of path with the wind getting even stronger! On a rare grassy bit, where I'm going reasonably quickly, a big gust nearly sends me crashing into the surrounding rocks. I manage to keep my feet and crouch down until the wind subsides a little and I'm able to move again. I finally reach Sty Head pass where the wind is being funnelled between the massive mountains of Scafell and Gable. I can barely hear myself think let alone hear the comments of one or two walkers who have ventured out today - they just get the thumbs up instead! I seem to be on my own now as I head upwards to Esk Hause the next checkpoint. There are a few streams to cross and they are all raging with white water although I'm never in above my knees so there're no bother and it's still fairly mild. Because I can't be bothered with the faff of extracting map from bum bag I add a couple of hundred meters to the route in finding Esk Hause. No matter, I'm still ok. I force a bar down my neck and press on to Scafell Pike - England's highest mountain! No runners around me now but I'm happy with that. I know the route well so the mist is no problem. The wet rocks are a different matter though and I have a few slips and a few scrapes. Nearing the top I catch a few runners up and a couple more appear behind me so, at the summit (3210ft), there's a queue at the checkpoint! I follow a bearing off the top and descend the rocky, boulder strewn path. The rain and wind continue as I hit the grassy slopes of Lingmell. My foot goes down a hole and I just about stay upright - I curse the conditions. There are a few runners around so it's a race down the final steep descent. I overtake a couple but a searing pain from cramp grips my leg and they overtake me again. Further down I recover and take a few scalps in the last half mile. I'm feeling ok and the relief on approaching the finish is tangible. Susan's there to cheer me in and take my photo. I'm moving quickly as I cross the line and have a great sense of achievement on finally finishing. What a day! 6 hours 27 minutes - a bit slower than 12 years ago but conditions are so much more challenging today. 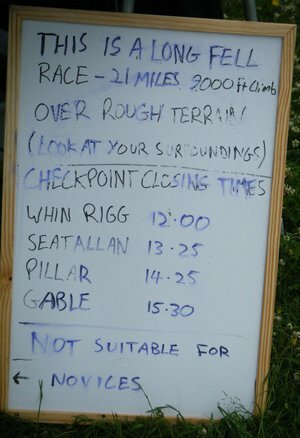 The Wasdale Horseshoe is a race many fell runners aspire to do. It tests your fitness, experience and fell craft to the maximum. Have a go by all means but please, as the FRA requires "you must be confident you are capable of completing any race you enter"! This 8 mile undulating, circular route was brilliantly executed by Derwent Valley Trail Runners, a relatively new club dedicated to running the trails and whose website proclaims that: "we are all free spirits and adventurers at heart and the countryside is there to be enjoyed by everyone", well said that club. Parking was organised swiftly, and numbers collected in the community centre. I proceeded with my usual pre-race warm up of wandering aimlessly around the place, and missing the group photograph. 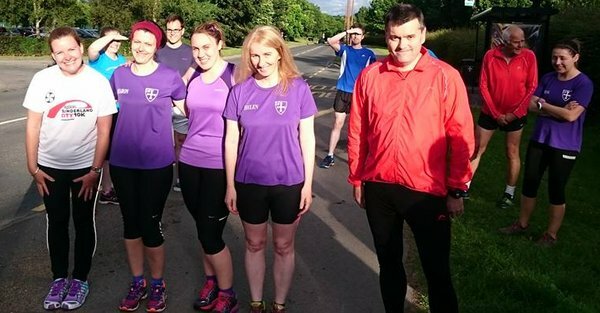 Decent chats with fellow Striders, until we were huddled onto a grass verge for our get set go. The race starts along a street and in mild confusion of not knowing which direction we were going I found myself in the middle of the field. We swiftly took a sharp left turn and immediately bottle-necked as there were stiles to cross. I frustratingly watched the lead pack disappear into the distance as I danced about like a coiled spring. I spent the rest of the race attempting to move up the field, but without room to manoeuvre along the overgrown single-tracks I was held back, which became annoying especially on the downhills, and whilst trying to pass runners wearing headphones. The route opened up through tracks and fields so I was able to overtake, picking runners off along the way. The first half is relatively downhill, with a flatish bit, and then the last few miles climb ever onwards to the finish. I was able to slowly catch runners on the incline and work my way further up, but not as far as I would have liked. Due to the recent British summer the route was muddy, so my choice of fell over trail shoes sat well, especially as I pranced through the woods and rivers. There was great encouragement from families and locals who had wandered out to shout us up the final climb, we joined the street on which we started and ran it home. Finishing in 16th positon out of around 160, I was fairly pleased. Refreshments by way of hot drink, soup, and cake were available in the community centre, donations welcome. This is a brilliant route for both experienced and novice runners, with a chance to run some fantastic local trails at £4 a pop this is one not to miss. 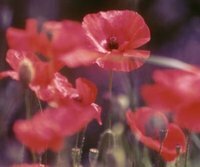 This weekend, to mark the Somme Centenary, Elvet Striders will be running a charity relay from Accrington to Durham. The first runners will leave St John's Church, Accrington at 7AM on Saturday morning, with the final runners reaching Palace Green, Durham, around 8PM on Sunday evening. 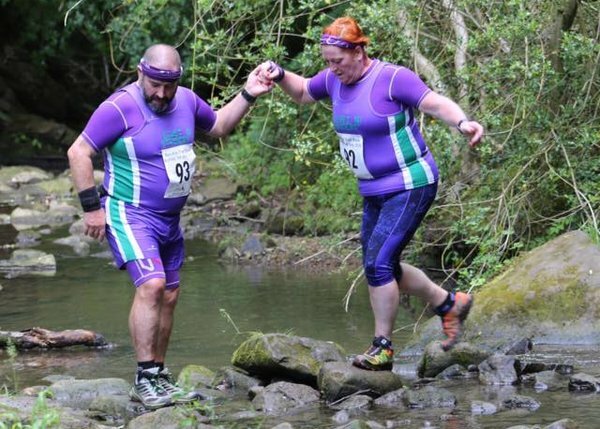 Further backround about the run and the relay stages can be found on our Relays 2016 page.